Origin and Habitat: Central Bolivia. Type locality: Pojo, Cochabamba, Bolivia. Pseudolobivia pelecyrhachis var. lobivioides (Backeb.) Backeb. Echinopsis subdenudata f. cristata aurea hort. Echinopsis subdenudata f. cristata hort. Description: Echinopsis ancistrophora subs. pojoensis (a.k.a. Lobivia pojoensis) is a hookspined cactus from (high) moutain areas distinguished from other varieties of the very variable Echinopsis ancistrophora for the larger sized stem with long tubed (ca 9 cm) reddish flowers. Plants grow mostly solitarily. Stem: Simple, subglobose, depressed, to 8(-10) cm in diameter ( up to 10 cm high in cultivation. Grown from seed. ), shining dark green. Ribs: 15-16(-20), stout, 1 cm high, broad at base, somewhat crenate, divided into many small tubercles. Radial spines: 3 to 7(-10), whitish, slender, flexible, spreading backward, 5 to 15 mm long. Central spine: Solitary, rarely as many as 4, sometimes absent, more or less curved or hooked, 1 to 2 cm long light brown. to long tubed (ca 9 cm). Outer perianth-segments, linear, acuminate. Inner perianth-segments, oblong, acute. Scales of pericarpel and tube with axillary hairs. They are mainly pollinated by solitary bees. Fruit: Ellipsoid, dirty green to greenish purple, somewhat dry, 16 mm long, 8 mm in diameter. Scales on ovary and flower-tube small, their axils lanate. Seeds: Spherical to ellipsoid, slightly constricted above the hilum, black, whit no aril. Echinopsis ancistrophora Speg. : has flowers of varying colors. Distribution: From south of Salta, Argentina to the border into southern Bolivia. Echinopsis ancistrophora subs. arachnacantha (Buining & F.Ritter) Rausch: has smaller clustering stems with yellow to yellow-orange flowers. Distribution: Region of Samaipata, Santa Cruz, Bolivia. Echinopsis ancistrophora subs. cardenasiana (Rausch) Rausch: has bright magenta to red flowers. Distribution: Tarija. Echinopsis ancistrophora var. densiseta (Rausch) Rausch: has longer end denser spines than some of the others and flowers are red. Distribution: Vallegrande, Santa Cruz, Bolivia, just at east of var. vallegrandensis. Echinopsis ancistrophora subs. pojoensis (Rausch) Rausch: has larger stems and reddish flowers. Distribution: Pojo, Cochabamba, Bolivia. Echinopsis subdenudata Cárdenas: has a globose to elongate stems to up to 8 cm high with 8 to 12 -ribs. Almost spineless or with very short cream spines. Echinopsis subdenudata f. cristata aurea hort. : yellow mutant completely lacking chlorophyll pigment with fan shaped stems. Echinopsis subdenudata f. cristata hort. : is a very nice crested Echinopsis, easily recognizable for its almost spineless body. 6) Ortega-Baes, P. & Lowry, M. 2013. Echinopsis ancistrophora. The IUCN Red List of Threatened Species. Version 2014.2. <www.iucnredlist.org>. Downloaded on 03 August 2014. 18) Zuloaga, F. O., O. N. Morrone, M. J. Belgrano, C. Marticorena & E. Marchesi: Monogr. Syst. Bot. Missouri Bot. Gard. 107: 3 Vols., 3348 p. 2008. Cultivation and Propagation: Echinopsis ancistrophora subs. 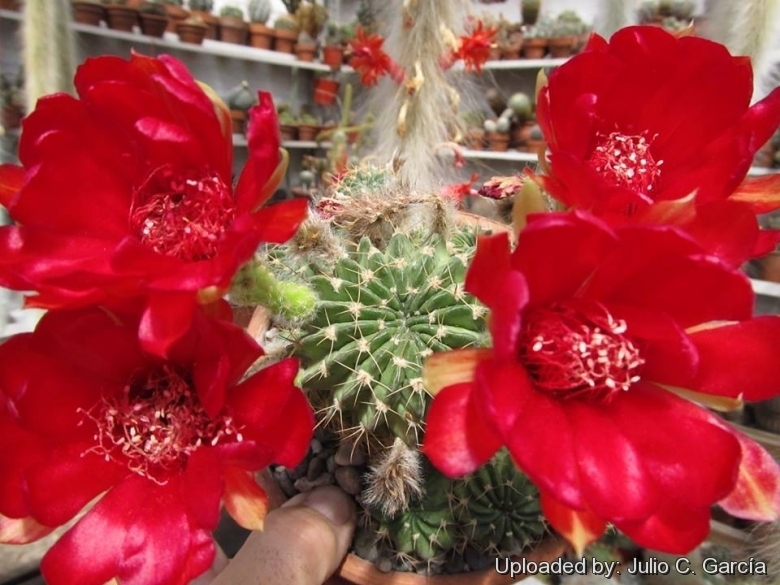 pojoensis is a good beginner cactus and very easy to grow and flower. It is quite resistant and occasionally gets covered by bright showy yellow blossoms also neglected in a dry windowsill. Requires good drainage and very porous potting mix. Watering Needs Need regular water in spring to fall but do not water again until dry. Also, it is a species that is dormant in the winter and require very little water (maybe even none) during the cold months. Frost Tolerance: Light frost protection required. Minimum of 5ºC for safe growing (but hardy up to -5°C or less) but some clones are hardy to lower temperatures. Requires to be kept below 7°C in winter to flower well in the spring. Sun Exposure: Requires bright light (protect from strong midday sun). In shade the body colour will remain mostly green, while full sun will darken it and give it red/brown body colour. Can be sunburned if moved from shade/greenhouse into full sun too quickly. The amount of sunlight it can withstand without scorching depends upon the how hot it becomes in the summer in the locale in which it is planted. It will have more colour if it receives more light. During the spring it may be able to take full sun until the heat arrives at the end of spring. In an area that has hot afternoon sun, it may be able to take full morning sun, but requires afternoon shade or afternoon light shade. Propagation: Seeds or offsets that appear at the base; leave them attached to form a cluster, or wait until they are 1/3 the size of the parent and then detach and plant.